Lines from Linderhof: So Proudly She Waves . . . Proudly waiving over the Kansas prairie at Fort Scott, Kansas, the only Kansas stop on the 50 State, Iran and Afghanistan Tour for this flag of freedom. How proud, we residents of Fort Scott were to be selected to display this historic flag for it serves not only as a reminder of all of those whose lives were lost on 9/11 but also as a tribute to those people who gave their lives to continue to make our country free! The flag arrived in Fort Scott in it's traveling case, and like any well seasoned traveler, there were souvenirs of its previous stops -- and, of course, Fort Scott, added their own! 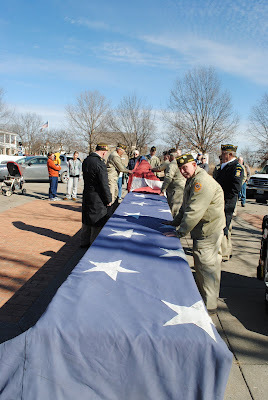 Our local VFW and American Legion helped prepare the flag for it's raising. These gentlemen continue to serve their country as they are called upon daily to do the ceremonies at our National Cemetery for the veteran's burials. Some are World War II vets and some are Korean vets and some are Vietnam vets! Many hands make light work as the flag is being prepared to be raised. Besides our local veterans, local first responders are assisting. the flag, attached to a Fort Scott, Kansas fire truck and a Nevada, Missouri fire truck . .
And the veterans and first responders, saluted the flag and all that it stands for. And then, the crowd gave the Pledge of Allegiance. I must admit that tears were streaming down my cheeks. This flag is a special flag -- this flag from the World Trade Center. 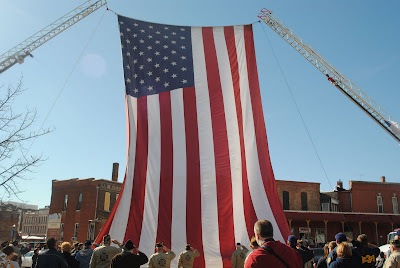 And like the flag in our National Anthem, which is but one verse of the poem by Francis Scott Key, Oh, say does that star-spangled banner yet wave, o'er the land of the free and the home of the Brave! Gave proof through the night that our flat was still there. And this be our motto" "In God is our trust." If this flag flies in a city or town near you, I would definitely take the opportunity to go see it being raised and displayed. 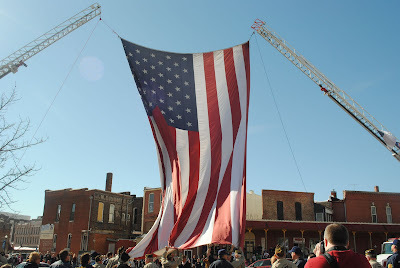 It is a tear jerking, lump in the throat event -- this flag! 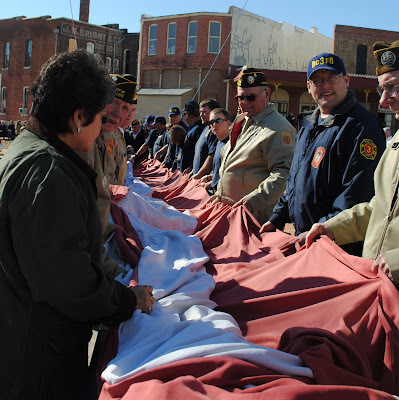 And I"m proud to say that on Monday, our friends in the town 20 miles East of us, will get to experience this ceremony as well as it will fly once again with the help of our fire department. One of only two stops in Missouri -- Nevada and Saint Louis. CORRECTION: I was under the impression that this was the World Trade Center Flag -- but it isn't. 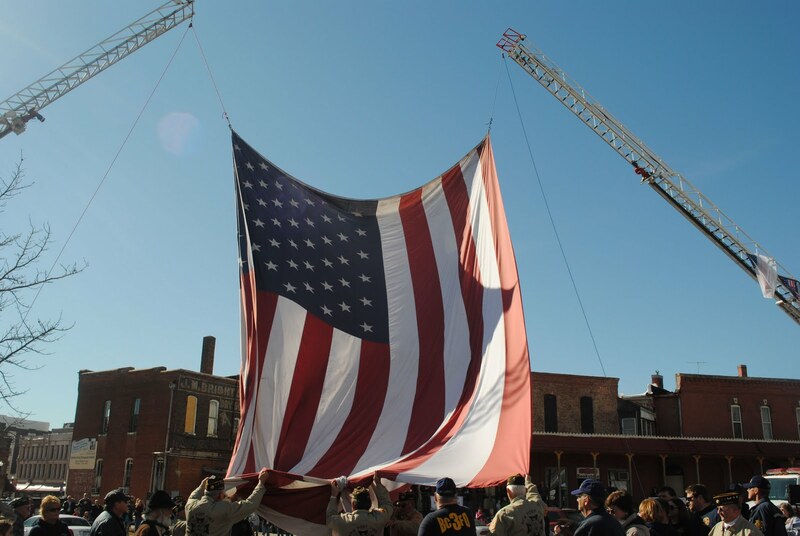 Instead it is a flag that is a tribute to the Armed Forces, First Responders, Second Responders, the 9/11 families and the fallen of the attacks on America, and all of the Public Safety Personnel on the JOB today willing to make the supreme sacrifice for others. The cross country tour began in San Diego on August 10, 2010 and ends back in San Diego in August 2011. The flag will then travel to Pennsylvania, New York City, Washington D.C. and Fort McHenry before an OFFICIAL retirement back in Escondido, CA. Sorry for the misinformation -- a little knowledge is always a dangerous thing!!!! This is so moving Martha. One of the many things I appreciate about your posts. Visually stirring. How nice to have experienced that. It makes u have goosebumps! I'm so glad your event was a success. Great post! 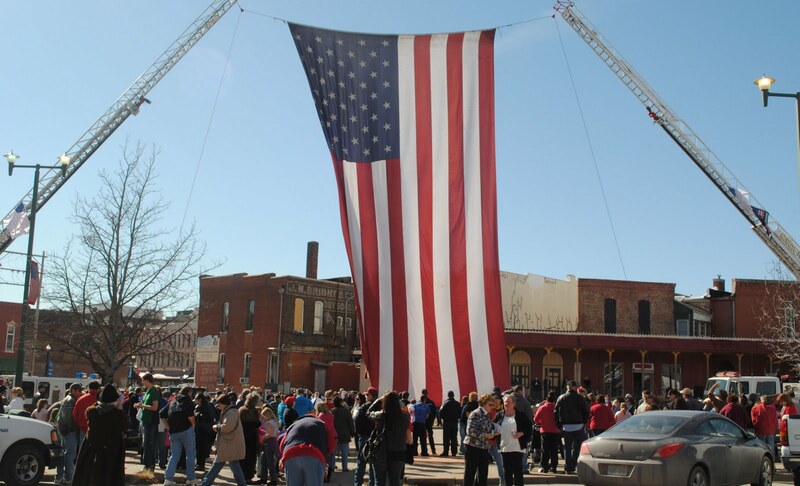 This flag was flown in a neighboring town last month, but the local media neglected give advance notice, so those of us who might have like to have gone to the ceremony were sadly, excluded. Our Portland media, reflecting the city/county government, is dominated by anti-military, anti-government types. They refused to allow the Portland Police Force cooperate with the FBI directly after 9/11. We had an incident of a terrorist bomber here last month, which was, thankfully, thwarted by the FBI and Oregon State Police without apprising the city. The flag is returning to Eastern Oregon in July, so at least (given the different political climate over there) there will be a large appreciative crowd. This was a precious, moving post! All the men in my family served in the Armed Forces. . .my own "Mr. Ed" being a career man! All their names are on the Veteran's Monument at the Park by the Old Fort there! 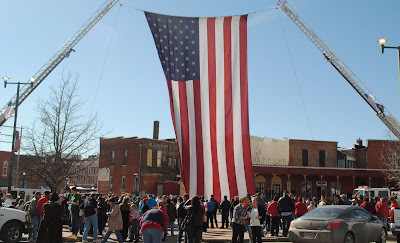 Thank you for posting this historic occasion in Fort Scott, Kansas!Being a retired military wife, I would have had tears, also! Thank You for sharing this moving event. I had no idea it was coming to St. Louis and will now start searching to find the date and place of the event so I am positive to attend. Oh, this post gave me goose bumps as I read it! 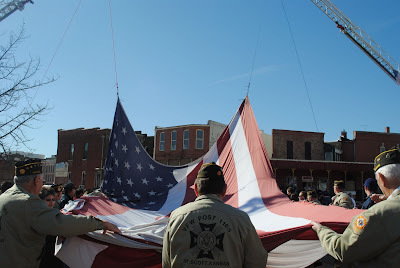 What a moving experience and an honor for your town to be host to this event. 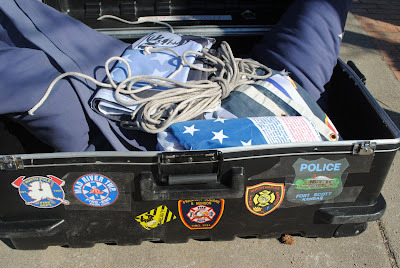 We need more patriotism and gratitude for our soldiers and first responders. I hope events like this stir that kind of feeling in more Americans. What a wonderful story! Thanks for sharing!